The new automobile delivery wagon for the Free Library has arrived here and will be put into service at once. The wagon was run about the streets yesterday by a representative from the International Harvester Co., the makers, and was very much admired. It has a 22-horse power engine and solid tires. 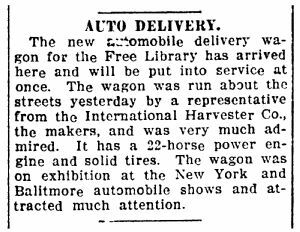 The wagon was on exhibition at the New York and Baltimore automobile shows and attracted much attention.